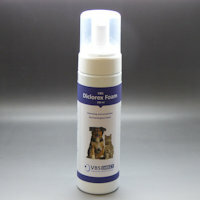 VBS Direct Ltd - VBS Diclorex Foam - Innovative solutions for the veterinary professional. Dermatological foam indicated as adjuvant to therapies managing various skin diseases including allergies, bacteria, parasites, fungi and skin irritation. Its innovative composition enhances the deep cleansing and cleaning of skin and coat, aiding the reconstitution of a lipidic layer that protects the skin and decreases itching and irritation in the cutaneous layer. It can be used alone or as topical adjuvant in association to specific medical therapies while treating dermatitis. It is easily and completely absorbed. Press the top trigger to dispense the desired quantity of mousse. Spread it evenly over the area, usually applied twice a day or as needed, and gently massage the foam into the skin and coat. Continue daily application until resolution, or following your veterinarians advice. Avoid product ingestion or licking by the subject. If your pet has a dirty or greasy coat we recommend the use of VBS Dermo Shampoo or VBS Dermomouse prior to using this product.